The land just east of the Fox River, which now is the Village of Tower Lakes, was covered by glaciers during the last ice age until just 11-12 thousand years ago. Soon after the ice retreated, the area began to be used as prime hunting land by the first of many tribes of Native American Indians. The first people here hunted the woolly Mastodons that roamed Lake County until 8,000 years ago. They were followed by Archaic Indians who made stone tools, and Woodland Indians who were the first farmers in Illinois. Remnants of these ancient cultures have been found along Kelsey Rd. near River Rd. and near Rt. 22. The 11,000 year old artifacts excavated in 1994 & 1996 on the McGraw farm, just west of the Tower Lakes border, are the earliest known evidence of humans in Lake County. In the last 1000 years, several successive Indian groups made this area their home. The most recent of these tribes were the Potawatomi in the late 18th and early 19th centuries. The Prairie Band of Potawatomi farmed corn and other crops in the summer and hunted buffalo in the fall and other game in winter. Their homes were rectangular or oval with bark covered dome-shaped roofs. In the 1833 Treaty of Chicago, following the end of the Blackhawk War, the Potawatomi and other Indian nations ceded all Northern Illinois land between Lake Michigan and the Winnebago River (Rockford) to the United States. They began to move on to Kansas via Missouri and Iowa. Some migrated to Wisconsin as well. The first permanent European-American settler in Cuba Township was Amos Flint, who built a cabin in 1834 near the present corner of Kelsey and River Roads, and for whom Flint Creek is named. The area was part of Cook County from 1831 to 1836, then McHenry County from 1836 to 1839. In 1839 McHenry was divided in half and Lake County was formed. US surveys were completed in 1840 and land sales to settlers began. Records of the Bureau of Land Management show that settlers bought land in the area during the 1840’s for $1.25 an acre from the U.S. Land Office. By the mid 1800’s most of the land which was to become Tower Lakes was occupied by three of these hardy pioneer farm families whose members played influential roles in the development of the villages of Wauconda and Barrington. Hugh Davlin was one of the first pioneer settlers in Cuba Township. He and his family arrived from Troy, New York around 1836. Although there were no roads then, he chose land at the intersection of two main Indian trails. Like the other settlers, he had to wait until after 1840 to formally process his purchase. He bought the 80 acres surrounding his log cabin from the U.S. government in 1845 for $100 and soon added an additional adjacent 240 acres. His son Charles expanded it further, to what was described as the largest farm in Cuba Township by the time of his death in 1915. The second Davlin farmhouse, believed built in 1865-9, still stands today at 108 East Tower Dr. A one-room school, the Davlin School, was built around 1857 just north of the farmhouse. The trails became roads, and the intersection by the school and the Davlin farm (now Barrington Rd & Indian Trail Rd) became known as Davlin’s Corners. Another Irish immigrant, John Murray, arrived in the 1830’s and bought 80 acres of government land west of the Davlins. They expanded and eventually had a farmhouse near the site of the current dam. His son Dennis fought in the Civil War along with one of the Davlin sons. John Lewis Brooks, a Baptist minister who first came to Cuba Township in 1837, bought a 120 acre farm in 1857 in the area now containing North Lake and North Lake Shore Dr. Elder Brooks, as he was known, was the first pastor in 1847 at the Old South Barrington Church on Penny Rd. at Barrington Rd. He later helped build a Baptist church in Wauconda in 1856, now the Federated Church. His son Eugene W. Brooks became the mayor of Wauconda (1903-06), as did Hugh Davlin’s great-grandson Charles E. (1953-7). A daughter, Florence, and her husband William Paddock lived on the Brooks farm and eventually owned it. There were no lakes here in the 1800’s. The farms prospered, especially after the Chicago and North Western railroad was completed through Barrington in 1854. Barrington grew as a center of local commerce and became incorporated in 1865. Wauconda incorporated in 1877 and became a dairy center and summer resort. Davlin’s Corners, being on the road between the two nearby villages, was convenient to both. A blacksmith shop, operated by Brandy Walker, existed at Davlin’s Corners in the late 1860’s. The stagecoach carrying mail between Barrington and Wauconda passed through Davlin’s Corners and along present-day Gateway Dr. from 1854 to 1913, when it was replaced by the Palatine, Lake Zurich & Wauconda Railroad. In the summer of 1924, 70 acres of the Brooks/Paddock farm was sold to a partnership called D&B (Myron H. Detrick & William E. Brooks). Myron H. Detrick was a Chicago industrialist & inventor who was also president of the Palatine, Lake Zurich & Wauconda Railroad (1920-1930). He owned a farm near Slocum Lake, just north of Tower Lakes. Detrick’s partner and farm neighbor, William E. Brooks, was a farmer who went into real estate development and later became known for the Williams Park subdivision built on his family farm at Slocum Lake. Brooks was also a director of the PLZ&W Railroad. William E. Brooks’ father and sister had once owned a parcel next to the Paddock farm and they may have been distant relatives of Florence Brooks Paddock. This partnership had the idea of creating a lake, with the help of Vincent Davlin and his son Charles, by building earthen dams between two pairs of hills along Mud Creek, which ran through the three farms. The first was where the large suspension bridge linking the east and west sides of the main lake now stands, and later one was added where the present dam is. Detrick & Brooks subdivided the Paddock farm into small lots, hired Fred Watson, the railroad’s Wauconda station manager, as sales agent and began to sell summer cottages by the new lake. They hoped this resort development, which they named Tower Lake Park, would generate traffic for their failing railroad. They built a 68 ft. steel observation tower atop the highest hill on the west shore, planning to eventually extend it to 100 ft. It offered a good view of the Fox River and gave rise to the name of the lake. 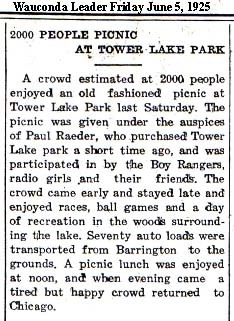 The front page feature story of the June 26, 1924 Wauconda Leader called Tower Lake Park “one of the most beautiful spots in northern Illinois”. In December 1924, the one-room Davlin School burned. It was rebuilt of red brick in 1925 and renamed the Tower Lakes School. It operated until 1947 and is now a private home at 410 N. Rt. 59. 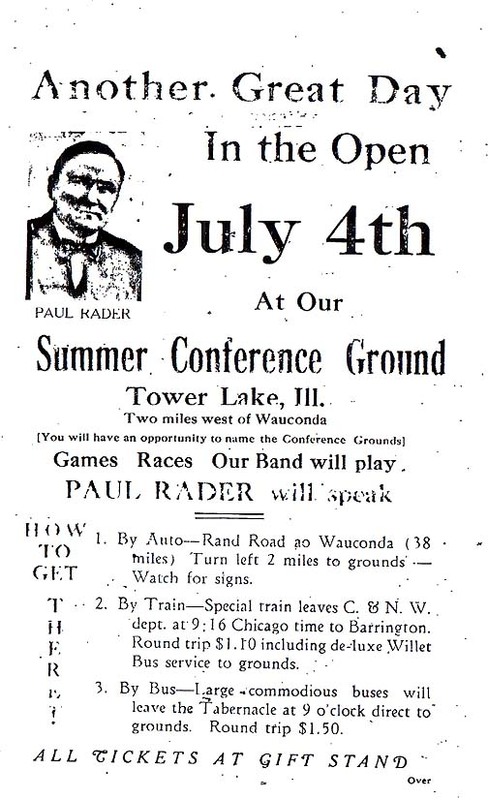 In 1925, Tower Lakes became the center of a promotional plan by nationally prominent radio evangelist Paul Rader, who started using the land as a revival camp grounds for his Chicago Gospel Tabernacle religious group. In May 1925, he purchased the 70 acre D&B Tower Lake Park property, plus much of the Davlin farm (the portion west of Barrington Rd), the remaining 50 acres of the Paddock farm, the entire Murray farm and a small part of the Gus Sick farm, for a total of 367 acres, including all of the lake. Followers of Rader filled the grounds on summer weekends in 1925. An estimated 2000 attended the Memorial Day picnic. The plans called for a 5000 seat tabernacle, hundreds of summer cottages, a radio station and a welcoming beacon light atop the 68 foot high namesake steel tower. As it happened, these plans were not completed except a few summer cottages. Instead, a businessman – lawyer named Nazareth Barsumian discovered the area. Born in 1883 at Aintab, near Antioch, Armenia, Mr. Barsumian had developed a love of nature and outdoor living as a youth in his native Armenia. After graduation from American College at Aintab, Mr. Barsumian migrated to the United States in 1902 and settled in Baltimore. He attended Johns Hopkins University and in the spring of 1905 moved to Evanston, Illinois. He graduated from John Marshall Law School, carried on an oriental rug business, and subsequently, real estate. Mr. Barsumian first saw Tower Lakes in the fall of 1925. It did not take much more than one look to convince him of its potential. A group of Evanston partners, led by Barsumian, purchased the land from Rev. Rader, planning to convert Tower Lakes into a residential subdivision. In the spring of 1926 he took over active management of the development, now called Tower Lakes Estates. He was assisted by Alfred W. Bays, Northwestern University law professor, for whom a street and park are named. 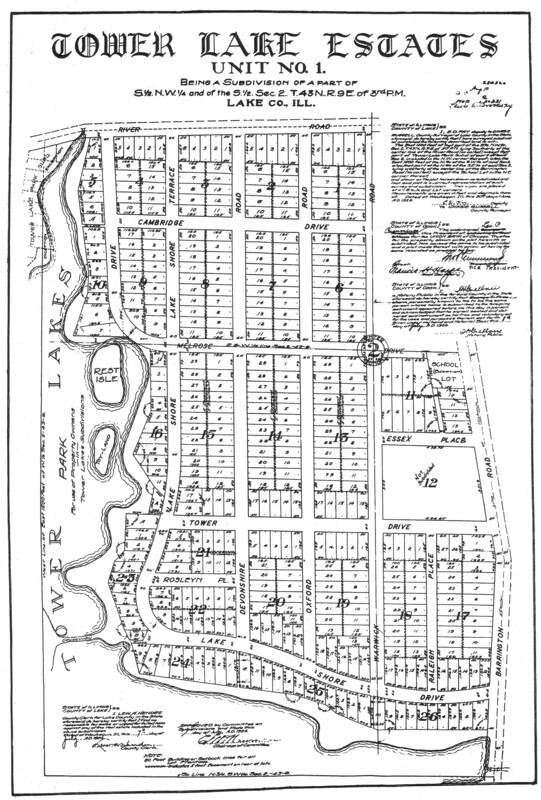 A subdivision plat was laid out for the former Davlin land east of the lake in 1926 and lot sales and more cottage construction began. Development proceeded slowly but in an orderly pattern. In 1927 the present dam near the southwest corner of Tower Lakes was constructed, replacing the simpler dam there. This deepened the beautiful south section of the main lake and brought the total lake acreage to 66. A Texaco? filling station and a Tea Room existed at Barrington Rd. & Indian Trail Rd. in the 1930’s. Growth proceeded to the point that a governing agency was needed and the Tower Lakes Improvement Association (TLIA) was formed in August 1930 and chartered by the State on February 27, 1931. Harriet W. Graham was elected the 1st TLIA president. Around 1939 another dam was constructed on farmland north of the main lake and the 6.5 acre North Lake was formed. By this time, nothing but ruins remained of the steel tower, which once stood along Summit Drive at the development’s highest point. By Sept. 1940, there were 30 families in year-round residence and 53 others with summer or weekend homes. In the 1940’s and 50’s, the move to convert summer cottages to year-round use accelerated. 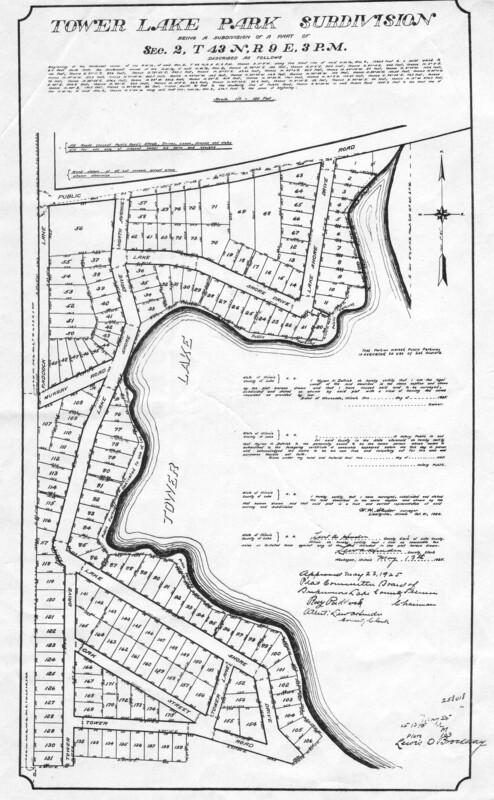 In 1941, subdivision plats were recorded for undeveloped lands in the North Lake and Summit Dr.-Scenic Dr. areas. Mr. Barsumian deeded the lakes, shorelines and park lands to the Tower Lakes Improvement Association in 1938, 1946, 1959 and 1960. Mr. Barsumian died in 1963. His son Edward Barsumian (estate trustee), Mr. Howard A. McKee (successor trustee), wife Rose Barsumian and Mr. Khoren Hussissian, completed the development of the remaining undeveloped lands in the original 400 acre Tower Lakes Estates area. These lands were owned by the Nazareth Barsumian Estate, Mrs. Barsumian, and the Tower Lakes Foundation, a charitable organization founded by Mr. Barsumian in 1954, chiefly to aid education. In the 1960’s, neighboring villages were rapidly expanding their territory. TLIA leaders concluded that incorporation was the best avenue to protect their interests, particularly to provide more options to fund road improvements and control building and zoning. On September 12, 1966, another cherished goal of Mr. Barsumian was realized when Tower Lakes residents voted to incorporate as a Village. TLIA President Cyril C. Wagner was elected the 1st Village President, a post he held for 13 years. Subdivision development and annexation brought additional areas into the community over the next 30 years, including South Hills, Marian Hills, West Hills, Fenview Estates, Country Club Estates and Tower Trails. The latter two subdivisions are on former Davlin farmland east of IL Rt. 59/Barrington Rd. Other parcels were added to square off Village boundaries. The additional areas continued to match the original plan of the community for open space preservation and recreational use. The Barsumian successors donated over 30 acres of additional open space to TLIA and to the Village in 1969. From it’s inception in 1966 until 1991, Village government operations and records, including the Police Dept, were run out of the homes of the various officials. Meetings were held at the former Gooch/Baird & Warner real estate office on Rt. 59, a building which had served in earlier decades as Mr. Barsumian’s community administration building. In 1991, the Village obtained temporary storage and meeting space in the neighboring village of Lake Barrington at their former Park District building on Kelsey Rd. In March 1992, the Village leased office space in the Market Place shopping center in Lake Barrington. In 1995, the Village purchased the Baird & Warner real estate office at 400 N. Rt. 59 in the center of Tower Lakes, establishing the first permanent Village Office and Police Station. The community’s focal point had returned to “Davlin’s Corners” though at the same time it’s only remaining commercial place of business closed. In 1995, the Village entered the utility business by purchasing the Tower Lakes Water Company’s assets from private owners. Residents approved a bond issue to fund a series of upgrades to the water. Additional early history on the area can be found on-line in Arnett Lines’ “A History of Barrington, Illinois” as well as at the Barrington Area Historical Society. Other excellent references on Lake County history include Virginia Mullery’s 1989 book “This Land of Lakes & Rivers, an Illustrated History” available in area libraries or through the Lake Co. Chamber of Commerce, “Old Maude”, by Richard Whitney, a history of the PLZ&W Railroad, and “Lake County, an Illustrated History” by Diana Dretske. Help! The Village of Tower Lakes and the TLIA are collecting historical information on Tower Lakes for our files and for sharing on our web sites. If you have any of the following, please consider donating or even loaning them to the Village. Contact the Village Office or Village Historian Dave Parro.